Oh yes, I am all about the helpful housework tips. Housework is my all-time favorite thing...HA! 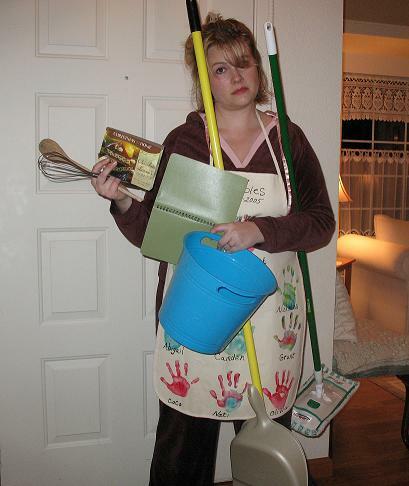 Here's a good pic of me - obviously loving the housework. 1. Make sure your dog is shedding to the point where fluffs of dog hair are floating happily around your floor. 2. Let ants invade - not with one trail to a specific spot - but with scouts sent out all over the place hunting down those remaining Thanksgiving crumbs. 3. Let the wind and rain drop plenty of leaves on the ground so they can stick to all shoes and get tracked evenly throughout the house. 4. Have your son take the garbage out by walking through the house instead of going out the back door, with the bag leaving a trail of drips from some mystery substance. 6. Have your son do some crafting, especially with glitter. Make sure he gets up and down and moves around a lot, causing a "breeze" to blow the glitter everywhere. 7. Spill some food in the kitchen, preferably something out of a box, preferably because somebody put it away with the open end hidden so you accidentally point that end toward the floor. 8. Use a 3-hole punch on a whole stack of papers, but make sure you don't notice that the bottom isn't on all the way so that when you pick it up the bottom falls off and little paper circles fall all over the place. 9. Let the dog throw up, in the kitchen, on a rug, right in front of the back door just as you are approaching it to let him out. 10. Walk around in the mud, then let it dry on your shoes and forget all about it. A couple days later walk all around the house in those shoes so little clumps of dried dirt mark your path. I am so motivated to vacuum now! Except that I just did. Because of the ants. Are you the sort of person who vacuums daily or are you going to use some of my motivators to help you out? What vacuum motivational ideas do you have (you *must* have 1!)? 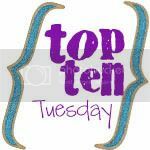 I'm linked up with the fun & fabulous Oh Amanda for Top Ten Tuesday! Stop over there for more fun! Have a lovely day friends!! I vacuum daily, every afternoon when I get home from work. It doesn't take that long. I do this as we have a long haired fluffy cat who lives indoors and she likes to leave hair about (black hair) - vacuum cleaning keeps me on top of her hair!! I am not always motivated, it is something I just do. VERY good motivators my friend. But I think I'm going to try to avoid 1-10. Ha! Ha! You know now that we don't have dogs I don't vacuum near as much. It was mainly the dog hair that was noticeable. I have one of those battery powered ones for quick kitchen clean ups so that helps spread the time between vacuums too. Big pulling one out of the archives is always a motivator in my book size hugs to you! Oh this was a great list...and I can attest to the effectiveness of number 8 - dare I say it...more than once! Oh girl, I can totally relate. I usually get motivated when I know someone is coming over, but my main vacuumer is my husband. He likes "clean lines!" But, my biggest struggle is sweeping and mopping. With two little girls, it seems like as soon as I sweep and mop the floor needs to be swept and mopped. So discouraging!